Liquid foundations haven’t been a part of my life since I discovered Everyday Minerals Semi Matte powder but for those that followed my wedding planning you’ll know I used a tinted moisturiser. My favourite is Madara Moonflower Tinting Fluid but more recently I wanted to see what else was out there. I should mention that finding something linalool free was my top priority and I was interested in products with SPF as I was looking to buy before my holiday. In the end I decided on Yes To Grapefruit CC Cream (light tint). The Yes To range is affordable but I feel it can be a slight compromise with ingredients. I do however appreciate that some products are accessible in Boots. The CC cream states “colour corrects and hydrates” which I am feeling a little 50/50 about. Yes to the hydration but I’m not sure when it comes to colour correcting. This doesn’t cover every imperfection any more or less than Madara but it does provide a nice base for my Everyday Minerals. I feel the combination works nicely together. The tint is the right colour for me as I have a pale complexion and I don’t find it too dark or orange. "The Yes To Tinted Moisturiser is certified as an SPF18 under US regulations and guidelines, however as UK regulations are different it has not been certified here, hence the UK packaging does not show the SPF certification, whereas the US packaging does"
Now I wouldn’t suggest that this CC cream should be relied upon for sun protection but it’s nice to know you have little bit of something rather than nothing. I bought for my holiday in mind and I was using it for the evenings when going out for dinner so the sun is setting. The one big criticism I have for the Yes To Grapefruit CC Cream is the scent. It smells like plastic with a hint of grapefruit and honestly I can’t get past that. It lingers up my nose for so long. I’ll use up this bottle but I wouldn’t repurchase again on this basis. If you are someone who likes minimal coverage for lazy days or travelling then I wouldn’t say don’t try it. If you are really picky about scents then I’d say be warned you’ll either love it or hate it like I do. 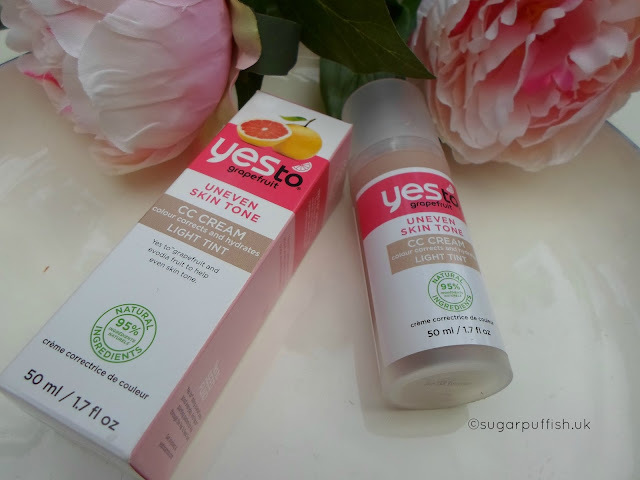 Have you tried this Yes To Grapefruit CC Cream? What are your thoughts about this product? The Yes To range is widely available online including at **Lucy Rose.